Chicago Mayor Emanuel Keeps His Job In Tough Runoff Election : The Two-Way Pushed to the brink in an unprecedented runoff election against Cook County Commissioner Jesus "Chuy" Garcia, Mayor Rahm Emanuel won nearly 56 percent of the vote. 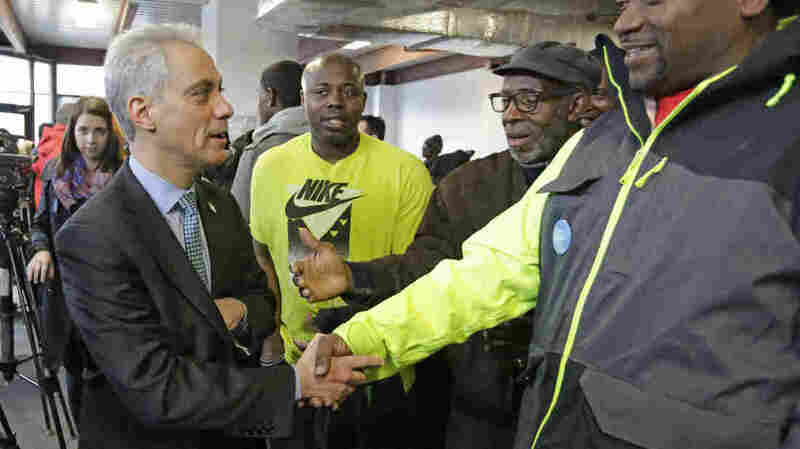 Chicago Mayor Rahm Emanuel shakes hands at a campaign office Tuesday, as voters gave him a second term. He won a runoff election against Cook County Commissioner Jesus "Chuy" Garcia. Pushed to the brink in an unprecedented runoff election, Chicago Mayor Rahm Emanuel used a huge campaign war chest and a softened image to survive the threat and win a second term in office. Emanuel defeated Cook County Commissioner Jesus "Chuy" Garcia, who had championed the city's poor and disadvantaged in hopes of becoming Chicago's first Latino mayor, in a race that mirrored divisions between the "Wall Street" and the liberal/progressive wings within the Democratic Party nationally. In official totals, Emanuel won nearly 56 percent of the vote to Garcia's 44 percent. The high-stakes mayoral election and 18 hotly contested aldermanic seats prompted close to 40 percent of Chicago's registered voters to cast ballots Tuesday. That's better than the near record-low 34 percent voter turnout in the first round of voting Feb. 24, which preceded the runoff, but lower than the near 50 percent turnout in 2011, when Emanuel won a wide open race to succeed long-time Mayor Richard M. Daley. Being forced into the unexpected runoff humbled Emanuel, who brought to Chicago's City Hall his caustic and hard-charging Washington style, and an in-your-face reputation earned in his days as a top aide to presidents Obama and Clinton, and as architect of the Democratic takeover of Congress in 2006. He acknowledged in a television ad that he "can rub people the wrong way, or talk when I should listen. I own that." The conciliatory tone continued on election night, as he thanked Chicago voters "for putting me through my paces" in this runoff and giving him "a second term and a second chance." He promised to change his ways and work more collaboratively in his second term. "I understand the challenges we face will require me to approach them differently and work in a different fashion." In conceding the election before a raucous crowd of supporters Tuesday night, Garcia remained upbeat. He recounted his personal story of coming to Chicago as a boy from Durango, Mexico, and he appealed to the next generation of Latino political leaders in the city. "To all the little boys and girls watching: We didn't lose today. We tried today. We fought hard for what we believe in," Garcia said. "You don't succeed at this or anything else unless you try. So keep trying. Keep standing up for yourselves and what you believe in. And someday one of you will be standing here where I'm standing tonight." It wasn't just humility that propelled Emanuel to a second term; he was aided by deep-pocketed supporters in Chicago and around the country. He raised nearly $24 million for the race, much of it coming from wealthy individuals and business interests, including $800,000 in contributions from just a handful of donors in the last three days of the campaign. Emanuel was able to bombard Chicago television viewers with thousands of ads, most of which attacked Garcia as unprepared to handle a looming city financial crisis. The incumbent mayor's enormous financial resources dwarfed the $6 million Garcia raised, much of which came in the last few weeks from the Chicago Teachers Union, other labor groups and progressive organizations including Democracy for America and Moveon.org. "How much did he (Emanuel) spend? Do the math. How much per vote?" asked Chicago alderman Ric Munoz, a longtime Garcia friend, supporter and one of just two of the city's 50 aldermen to publicly back the challenger against the mayor. "With unlimited resources like that, it's almost impossible" to defeat Emanuel, he said.